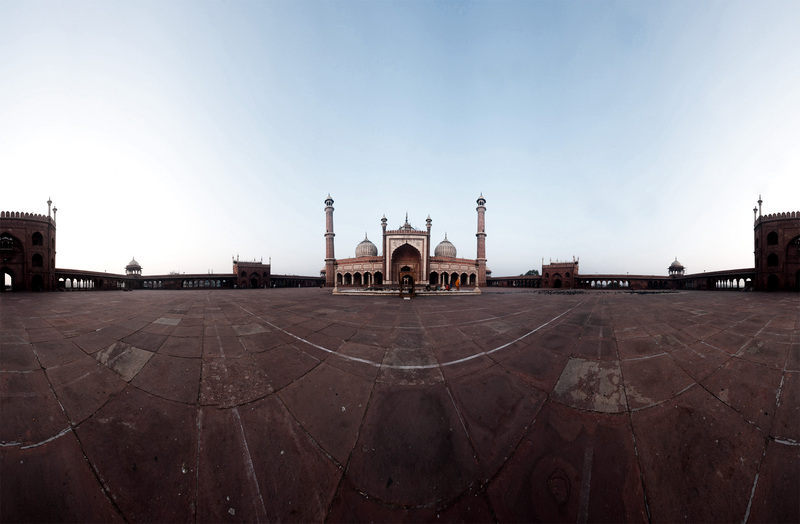 India's largest mosque, Jama Masjid in 360 degree panorama! You people should know the drill by now. It's panorama-rama on Daily Travel Photos! Grab the picture and move and zoom yourself around the mosque's spacious open courtyard. Note the pigeons feasting on food left purposely for their consumption. Why would anyone want to intentionally feed and, therefore, attract pigeons?!? I know not. Note the prayer hall wall faces West towards Mecca. My western education taught me that church naves and Mosques always face East towards Jerusalem/Mecca. Only when I began traveling did I realize there are full continents where "East" doesn't apply. Churches' naves in India face West as well!